Tampa, FL. September 27, 2012 – DW® is proud to announce the release of our new VMAXHD remote Application, available in the iTunes App Store. 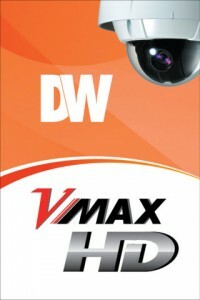 The new remote viewer with a user-friendly Graphic User Interface allows remote control of DW®’s new VMAXHD. The new app includes features such as multi-screen live video, search and playback, export images, PTZ control, and full zoom and focus control for DW® HD-SDI cameras. Minimum Operating System Required: iOS 4.3 or higher. Control your entire security system with the single touch of a finger. What’s New in the VMAX-HD remote app? Instantaneous access to DW®’s supported VMAXHD from anywhere in the world using either Wi-Fi or 3G connections.